When I think of comfort food, indubitably I think of pasta. Whether it’s Pad Thai or old-fashioned spaghetti with marinara sauce, sometimes I just gotta get my fix. I was grocery shopping and I came across a brand of gluten-free pasta made from rice and flax, so I decided to try it. I am not gluten-intolerant, but I do notice that gluten-free items do digest more smoothly – less of that “full” feeling. So, this pasta is pretty easy to make. If you don’t want to toast pine nuts, I suggest getting slivered almonds, but the pine nuts do add a great flavor. This pasta is light, but has the toasty elements of the pine nuts and roasted zucchini, and its topped off with that lovely zing from the fresh parsley. Nutritional yeast adds that savory element as would a dusting of Parmesan cheese. This recipe serves one, but double, triple or quadruple it to accommodate your eating plans! Buon appetito! Preheat oven to 370. While oven is preheating, toast pine nuts and set aside. Be careful not to burn them in the toaster oven! I know if I turn my back for literally 5 seconds, mine come out burnt, so watch those babies the whole time they are in there (about 5 minutes at 400 degrees). Now, the oven should be 370. Slice the zucchini, season lightly with black pepper and salt. Spray a cookie sheet generously with nonstick cooking spray. Spread zucchini evenly onto cookie sheet, spray some nonstick spray on top and roast for 20 minutes or until fully cooked and slightly browned. Chop about fresh Italian parsley. Add pasta, zucchini, parsley and 2 tsp olive oil to a serving bowl. Toss to mix ingredients and olive oil evenly. Top with a generous sprinkling of black pepper, sea salt to taste, pine nuts and garlic powder to taste. 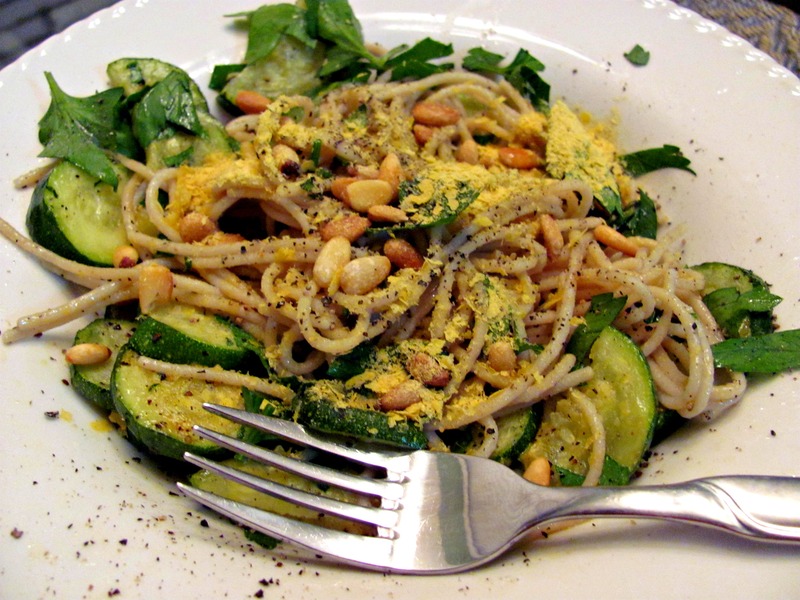 Sprinkle with nutritional yeast to give it that savory Parmesan cheese flavor! Serve immediately.